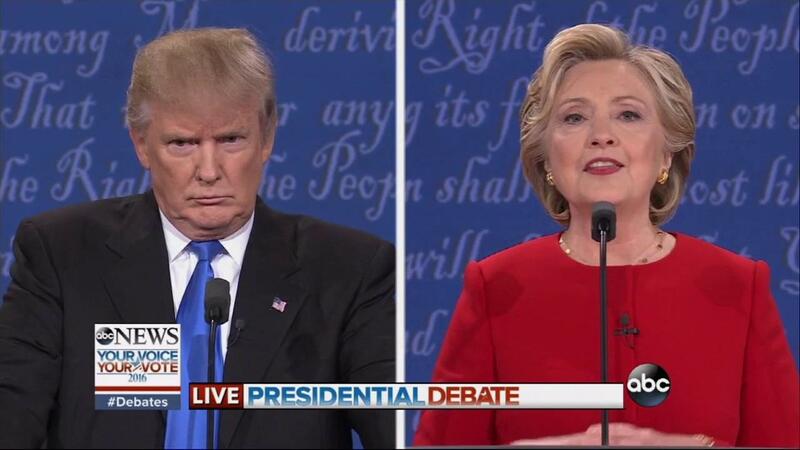 NEW YORK (WABC) -- Pundits may be discussing the fiery exchange of words during the first presidential debate between Hillary Clinton and Donald Trump, but the candidates' colorful facial expressions told a story on its own. Here are the seven faces that essentially sum up Monday's debate. 1. Clinton: "He paints such a dire, negative picture of black communities in our country." 2. Trump: Secretary Clinton? Yes? Trump: Is that OK? Good. I want you to be very happy. It's very important to me. 3. Clinton: I want to build an economy that works for everyone. 4. Clinton: "There are different views about what's good for our country, our economy, and our leadership in the world." 5. Trump: "I will release (my tax returns) as soon as the - look, I've been under audit almost for 15 years." 6. Clinton: "I know Donald is very praiseworthy of Vladimir Putin"
7. Trump: "No wonder you've been fighting ISIS your entire adult life." BONUS: The epitome of Lester Holt's moderating experience.